Photos claiming to depict the display found on the yet-unannounced iPad 2 show that Apple's next tablet might not feature a high-resolution Retina display. The 9 To 5 Mac site published pictures of the purported display originating from the iFixYouri iPhone 4 repair shop, fresh out of a China manufacturing plant. When compared with the display on the iPad, the leaked iPad 2 display is lighter and around 1 millimeter thinner, meaning that if this is really a part of the iPad 2, the tablet will be lighter and thinner, too. As seen in the photos, the bezel of the display is also smaller, which could allow for a change in the shape of the iPad 2, or just more space inside. Retina Display On iPad 3? The display on the current iPad is 9.7 inches and has a 1,024-by-768 pixel resolution. 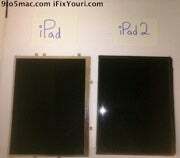 The leaked display of the iPad 2 has the same size and resolution. Both displays also feature the IPS (in-plane switching) technology, which gives a wider viewing angle. If the display leaked by iFixYouri is indeed the screen to be found on the iPad 2, this squashes rampant rumors of a higher-resolution retina display on the next-generation tablet that were circulated this month. Reports said the iPad 2 would have a 2,048 by 1,536 display, double the current resolution, making the screen what Apple would call a Retina display (as found on the iPhone 4). However, Daring Fireball's John Gruber argued that, as the latest leaked pics show, the iPad 2 does not have a retina display: "I believe the iPad 2's display will remain at 1,024?×?768. Its display may be improved in other ways - brighter, better power consumption, thinner, perhaps," Gruber wrote. The leaked photos from iFixYouri indicate that Apple is more likely to introduce a higher-resolution display on the iPad 3, when the mathematics of scale and price would make more sense for a 2,048?by?1,536 display on a $500 tablet.